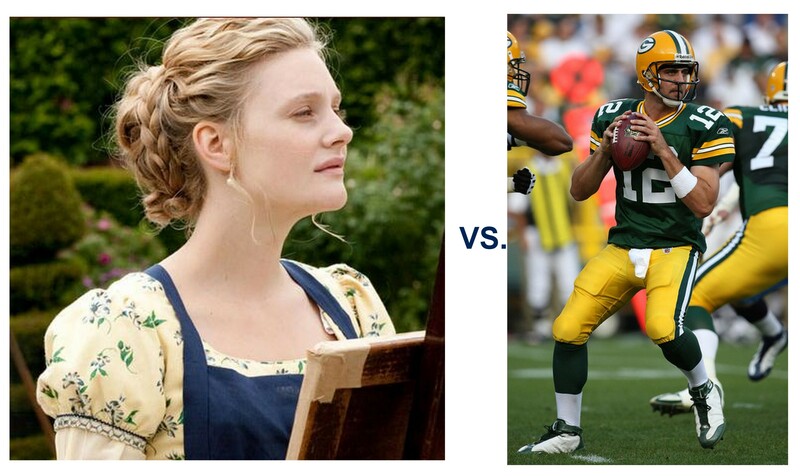 Emma Woodhouse vs. Aaron Rodgers, who will reign victorous on Super Bowl Sunday? 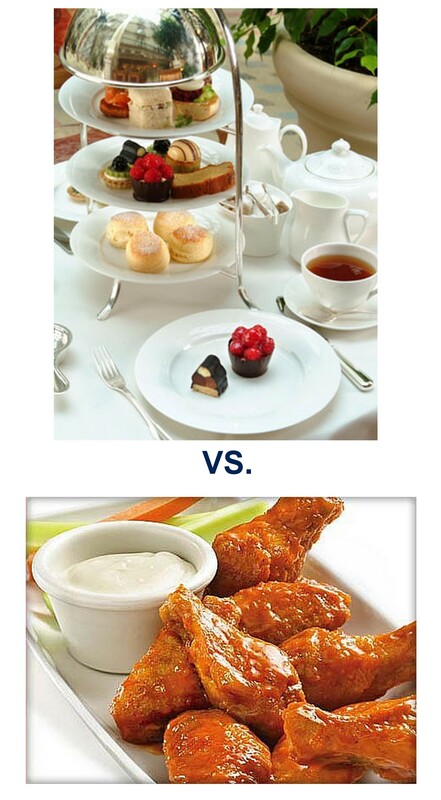 Super Bowl Sunday: an American ritual, perhaps exceeded in food consumption and togetherness only by Thanksgiving. A day when people gather ’round a roaring wall fixture (flatscreen TV), consume large quantities of poultry products (buffalo wings), and give thanks (for the prowess of the quarterback throwing for their team du jour). I’m not much of a football fan, but even I am compelled to take part in the festivities. But there are more things kicking-off on Super Bowl Sunday than a football game. Super Bowl Sunday is the first Sunday of the Masterpiece Theater month-long Jane Austen marathon. Girls, grab your tissue boxes and get ready for some Austenian happy endings. I always envision one house on Super Bowl Sunday hosting 2 parties — a his and a hers, an upstairs and a downstairs, the tea room versus the man cave. This year, everyone is going to Tony and Lizzy’s. Their recent renovation and Lizzy’s kitchen skills are the big draws. Tony put his year-end bonus into refurbishing the basement. A 65″ plasma hdtv, a surround sound system, 3 leather lazy-boy recliners outfitted with built-in coolers, a fully-stocked mahogany bar and beer fridge. Lizzy is a caterer who is in business with Anne, a pastry chef. Lizzy’s mini pizzas and 2-bite empanadas are legendary, and tonight, she’s one-upped herself getting a spread ready for the boys. Anne is bringing the English-tea themed baked items for the girls while Lizzy has prepared some canapes. Scones and clotted cream, petite cucumber sandwiches, and the requisite tea cakes are all arranged on the living room coffee table, in front of the second television and built in fireplace. Downstairs, the guys are ready to go. There’s 2 die-hard Steelers fan in the pack — one has painted his face, much to his wife’s chagrin, and the other brought his lucky game-day football, which none of the Green Bay fans are allowed to touch. Two of the other guys are Jets fans and are rooting for Green Bay out of spite. The final 2 don’t watch football, they’re hockey fans, but they both annually buy-in to their respective offices’ Super Bowl pool — they root for whatever team gets them closer to winning part of the pot. Luckily, there are no split loyalties among the girls upstairs. This year, PBS kicks off the Complete Jane Austen with all three parts of Emma. Everyone is on team Mr. Knightly. Swoon. Armed with their well-worn high school issued editions of the classic and several boxes of tissues, the ladies are ready to go. At the end of the night, all the women get to go home winners (there’s nothing like a happy ending) while half the male contingent goes home with broken hearts…all the men go home with heart burn — too many mini empanadas. As for me in the real world? I tuned into the game… but skim-read the novel during the commercials. Who says you can’t have your tight ends and Mr. Knightlys too? Trying to Remember It’s Not Hallmark’s Fault. It’s Tony and Katie’s.